Work to rectify a problem which has left a town “cut in half” is set to be completed after an MP posted rail chiefs a copy of a weekly newspaper’s front page. 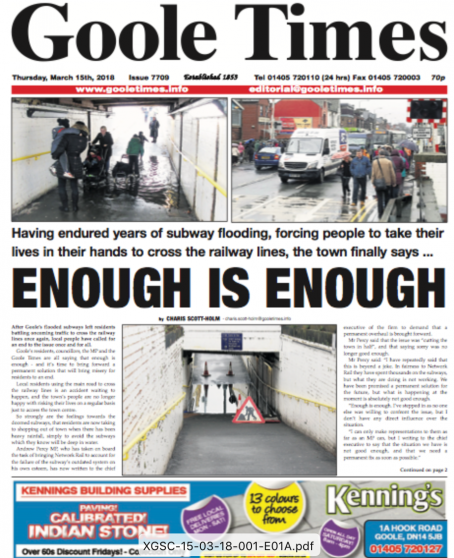 The Goole Times splashed last month on recurring flooding which occurs in subways outside the town’s railway station, running the headline “enough is enough”. According to people vox popped by the Times, the issue effectively “cuts the town in half” because the only nearby option for crossing the tracks to get into the town centre is a level crossing. Brigg and Goole MP Andrew Percy joined other prominent figures in calling on Network Rail to fix the problem, and sent a copy of the Times to the organisation in order to highlight the strength of feeling about the issue. Network Rail has responded to Mr Percy as a result, stating a detailed plan allowing the required work to be carried out will be completed by the end of this month. Charis Scott-Holm, senior reporter at the Goole Times, said she was “cautiously optimistic” of a solution. She said: “I’m glad they’ve taken notice of our front page, glad our MP has sent them the paper, and I hope they will commit to this promise. Editor Jane Rogers added: “The people of Goole have been unhappy with the state of the subways for years. Despite significant investment, no solution has been found to prevent the subways flooding. “As a mother of two young children, I find using the busy road when the subways are flooded to be unacceptable. Pushing a pram, or a wheelchair for that matter, across the railway lines is an accident waiting to happen, and many parents are not willing to take that risk with their children.